So here is my silly picture. 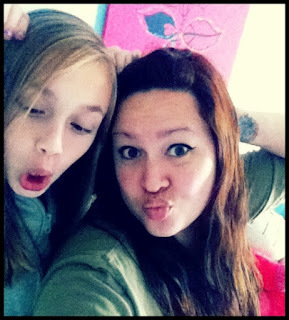 I made those famous duck lips and I'm not sure what my daughter is doing, but it's funny! It was nice to take take a break from unpacking...what a surprise? right!? Hopefully I can get some pictures up and tell you guys all about this crazy adventure were on. 1. Do you ever have reoccurring dreams? I have never had a reoccurring dream, but I've had some really cool things happen. I was a secret agent on a crazy mission. I was one of the survivors of the Apocalypse. I also spoke to some higher power/God type spirit once, that dream was awesome! I've also died twice. 2. It's the first day of Fall (or Spring for you southern hemispherers) in a few days, what are you looking forward to most? Everything pumpkin flavored!!! I can't wait to have pumpkin bread, pumpkin cupcakes, pumpkin ice cream and pumpkin spice coffee! 3. Because a lack of coordination, would you rather not be able to tie your shoes or cut your own food? Cut my own food, you can at least tear it with your teeth or hands. I don't want to be tripping all over the place! 4. Would you rather live in a house made entirely of glass or a house with no windows? 5. Would you rather walk on you toes or heels forever? My toes? At least I would seem taller that way. My sight, I love seeing and looking at everything. My a.d.d. doesn't help though. 7. What's your favorite movie quote of all time? Dory: Hey, look. "Esc-a-pay". I wonder what that means? That's funny, it's spelled just like the word "escape." Is that picture random? Well yes it is...but I think it's funny because a lot of people call me princess and I thought that picture was cute :) I hope everyone is having a great week! Oh! Gotta go...squirrel! Climbing up the tree out of my window!